Forty or fifty years ago all spool type flanged rubber expansion joints were hand built and many are still being made that way today. Hand built quality depends on a technician working at a slow speed foot controlled lathe that turns a form of the proper inside diameter. The form has a centered rubber arch or multiple arches to form the arch cavities, and adjustable steel flanges that are set for the face-to-face dimension. The builder begins by wrapping the form with a rubber liner that goes over the arch and up the flanges on both sides to form the tube. Successive layers of rubber impregnated tire cord are similarly worked up across the arch and up the flanges to begin the reinforcement system. Wire is spiraled over the tire cord to provide radial strength, and this process is continued until the uncured rubber cover provides the finish. Secondary steel mold plates are then clamped to the mandrel flanges to compress the uncured rubber and fabric. The body between the flanges is wrapped with Nylon tape to force the multiple layers into more intimate contact. Finally the complete wrapped assembly is taken off the lathe and placed in a steam chamber for curing and the mandrel, steel flanges and wrappings are removed after vulcanization. The carcass is trimmed and holes drilled in the rubber flanges to complete fabrication. The principal advantages of hand building are relatively inexpensive tooling and the ability to vary construction, size and materials in response to specialized demand. We have built joints as large as 12 feet I.D. This is a slow expensive process, but the heavily walled hand built joints withstand industrial service as no other commodity can. 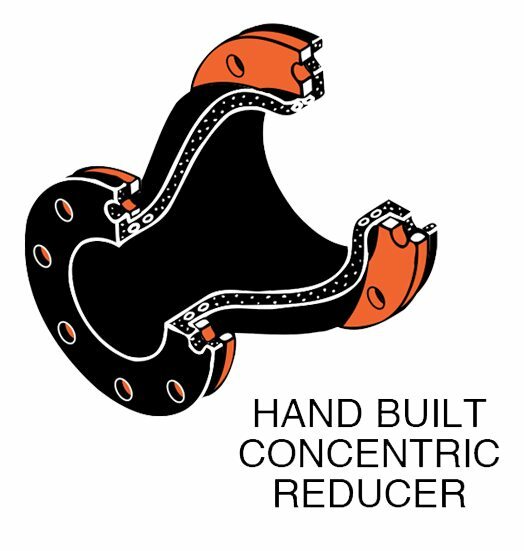 Interesting variations on the straight walled construction are the concentric and eccentric family of reducers. Variations of length and diameter change are infinite and reducers with a 12” flange on the inlet, dropping to 4” on the outlet are not unusual. We recognized the need for another lower cost approach for HVAC and looked to the tire industry. Tires withstand exposure to sunlight and ozone, rain, desert dryness, heat and cold, as well as high frequency and shock loads. They hold high pressure air without leakage while undergoing extreme flexure, even after many years of service and are often retreaded because the walls stand up so well. It would certainly follow that a similar construction would be most suitable for flexible pipeline connectors in HVAC applications. 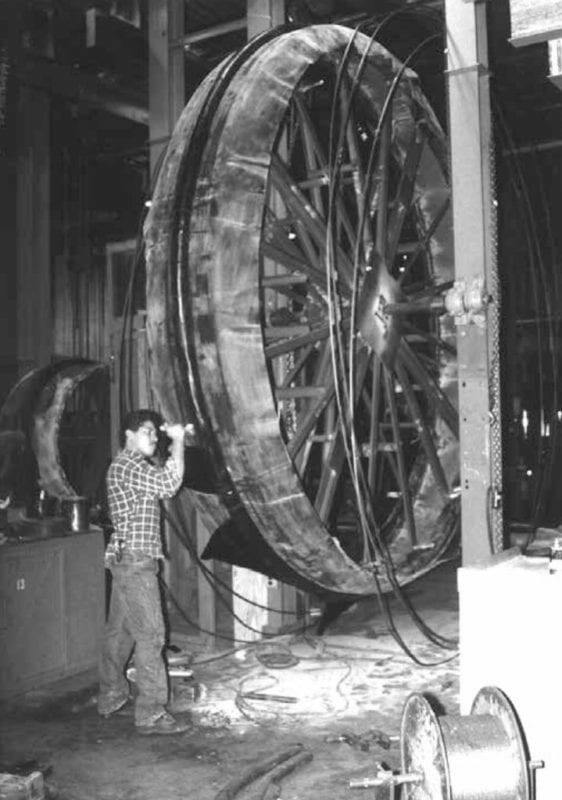 Spherical expansion joints were already on the market overseas and to a limited extent in the United States, so our direction was engineering improvement rather than invention. The manufacturing process is much simpler than for hand wrapped joints. All spherical expansion joints are built with straight carcasses. The tube and plies, as well as the cover, are laid up on a straight mandrel and the tire cord reversed and turned back around end cables or rigid end rings, depending on the style of expansion joint. The straight preform is placed in a steel mold that has been machined to the outside shape, rather than hand wrapped with Nylon. The mandrel has already been removed and replaced by an air bag. 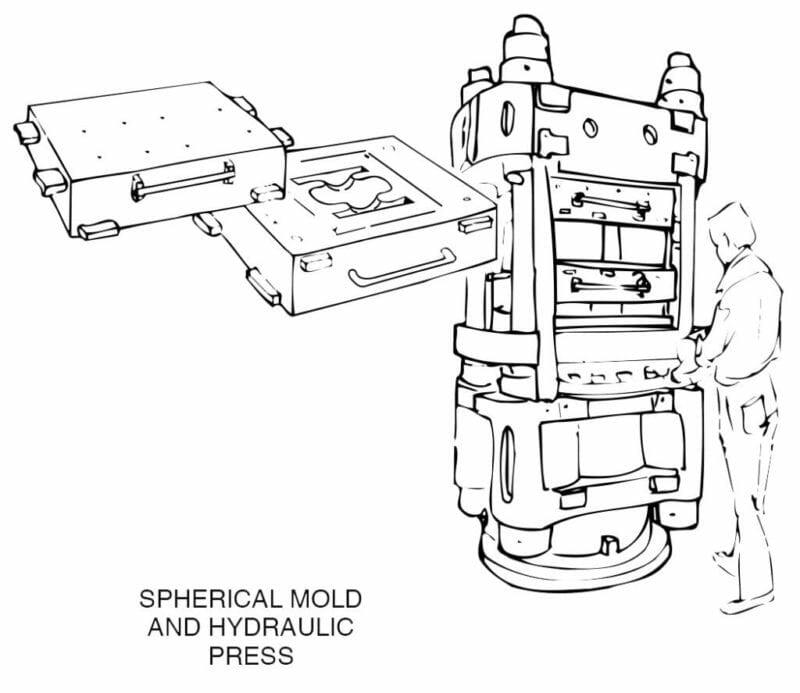 When the mold is closed with the help of a hydraulic press, two things take place. First, the ends are folded back to form the raised rubber flange, which is the same diameter as the raised face of a steel flange. Second, the spherical shape is taken when the air bag is inflated to force the carcass out against the hot steel walls. Instead of the steam cure that is used for the hand built joints, curing takes place in a hydraulic press with heated platens on either side of the mold. The air pressure used in this molding process is higher than the pressure normally obtained by hand wrapping, so spherical joints tend to be more homogeneous than hand wrapped designs. 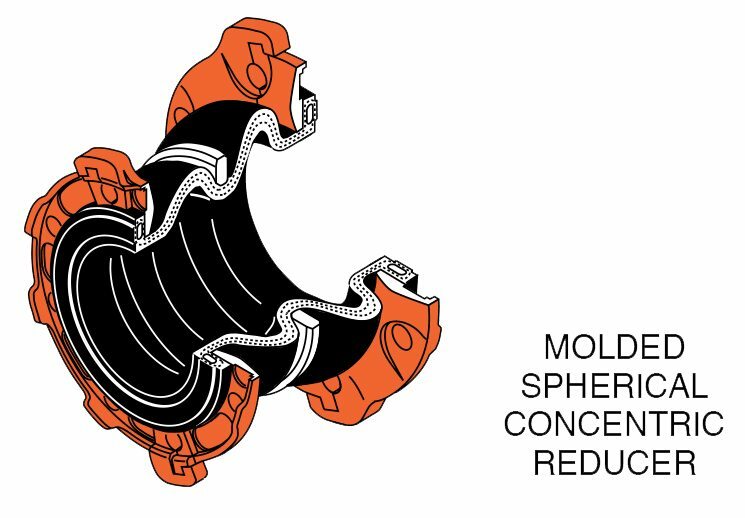 Spherical molded expansion joints differ from hand wrapped (spool type) joints in the final product as well as the method of manufacture. Spool type joints derive their radial strength from wire or steel ring reinforcement. The straight end sections between the arch and the rubber flanges are stiff rubber pipe. The only part of the joint that is not rigidly reinforced is the arch itself. 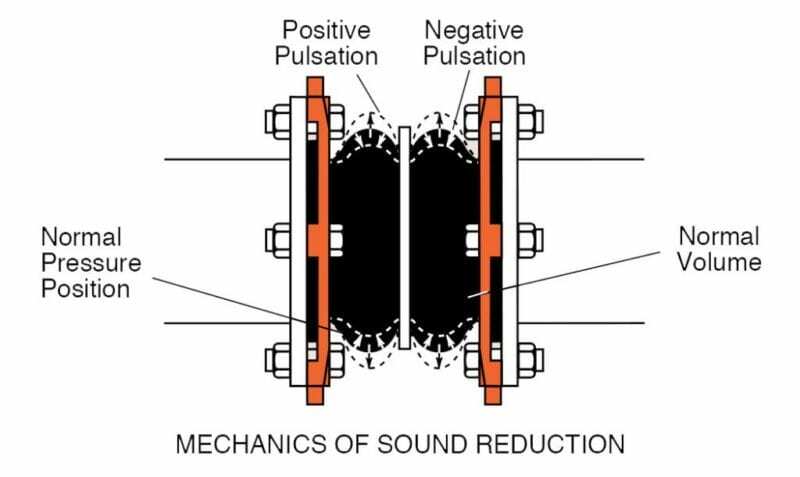 Since the design is for industrial applications where noise and vibration are of little consequence, spool type expansion joints only address movements. The arch is very heavily reinforced and quite stiff as well, so there is little change in volume in response to pressure. Hand wrapped arches are essentially straight walled so when the system is pressurized, the arch stretches like a bellows toward failure when unrestrained. 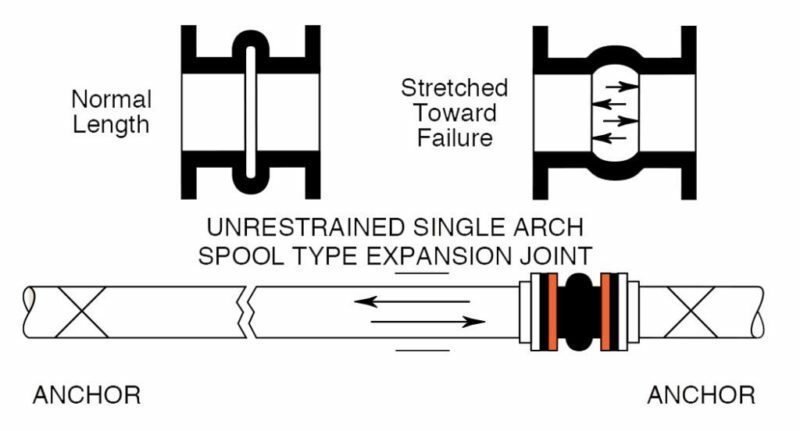 If the expansion joint is installed in a piping system with anchors both up and downstream, it is contained and performs very well in response to thermal expansion or contraction. In HVAC applications we are generally dealing with thermal movements that are handled some other way. The expansion joint is installed to make the installation simpler, compensate for misalignment, relieve the equipment flanges of stress, compensate for seismic movement and primarily to prevent the transmission of noise and vibration. The expansion joints are often installed next to equipment that is spring mounted, as is the piping. Therefore, the piping is not anchored, and if hand wrapped spool type expansion joints were used, it would be necessary to install control rods to prevent elongation failure. 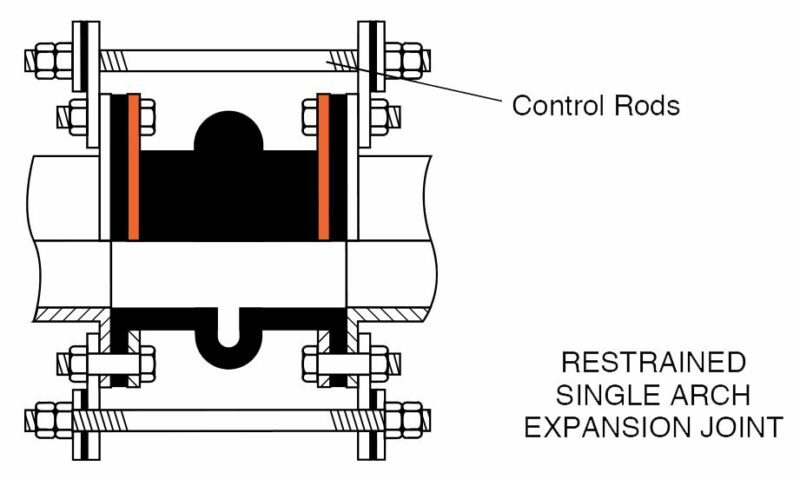 Once control rods are used in unanchored situations, the pressure thrust is always taken by the control rods so the control rods bypass the expansion joint and transmit both noise and vibration. Rubber flanged hoses were used in HVAC applications for many years, as eliminating the arch made the hose less sensitive to elongation. The carcasses were wire reinforced and quite stiff in the radial direction, but there was still a tendency to stretch about 7% of the length. While the hoses would not fail, the stretching created other problems, as a 36” long hose could stretch 21/2”. 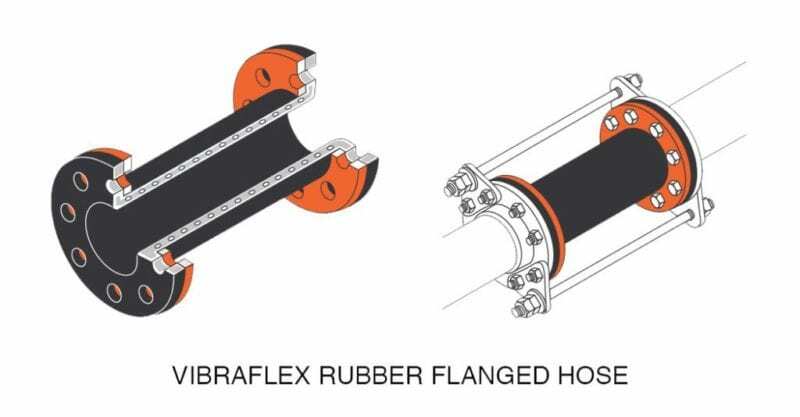 Since it is almost impossible to accommodate 21/2” elongation, hoses were similarly installed with restraining rods or cables on isolated or unanchored systems. Spherical expansion joint designs are entirely different. The spherical expansion joint is a spherical balloon. When a balloon is inflated, the diameter is fixed at a given pressure. Additional pressure will increase the diameter to a larger but predictable dimension. This principal is used in the design of spherical expansion joints. We cut two holes on opposite sides of the sphere and flange at those locations. 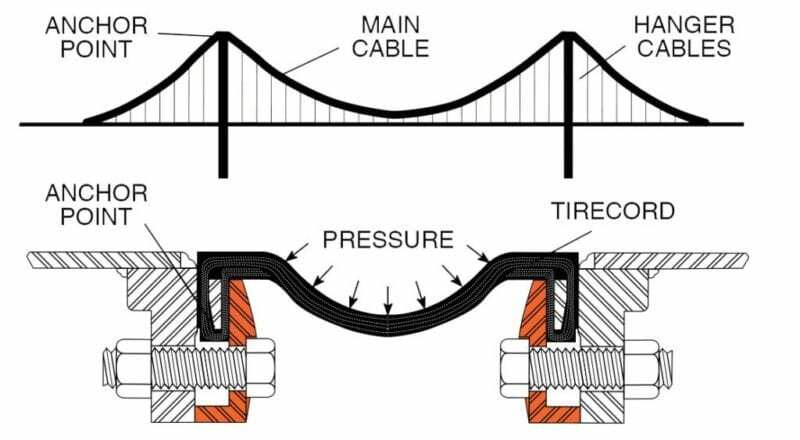 The resulting characteristics are entirely different than those of the spool type expansion joint where there are no counter balancing forces and the pressure causes elongation to destruction. There is no steel wire reinforcement in a spherical joint. The pressure is taken by reinforcing the sphere with tire cord bridging from flange to flange. Each fiber is loaded in much the same way as the principal cables of a suspension bridge between turrets. The hanging cables transmit the roadway loading to the main cable in a fashion similar to the pressure working on the wall of the expansion joint. By varying the number of ply layers and setting the angle of manufacture in relation to the axis of the expansion joint, the swell and movement of the ends can be controlled. 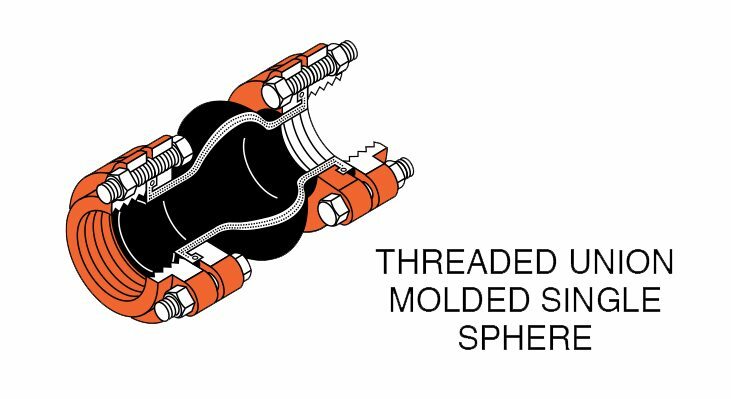 While they are truly expansion joints, we often describe this line of spherical devices as connectors, as they combine the most desirable properties of both hose and expansion joints. 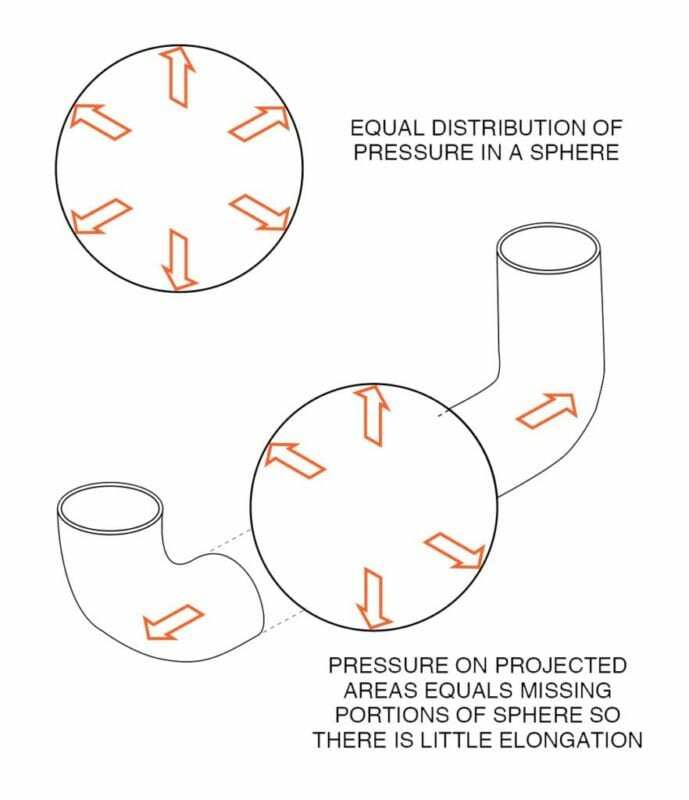 The spherical design develops a balancing force to the thrust generated by the pressure, so that the sections expand to a given predictable length under pressure. In this way they act like hose, but with very little extension. In unanchored locations, such as pipelines to spring mounted equipment, there are pre-extension instructions to the predicted length under pressure. This prevents compression of the springs or shifting of the pump or equipment foundations. 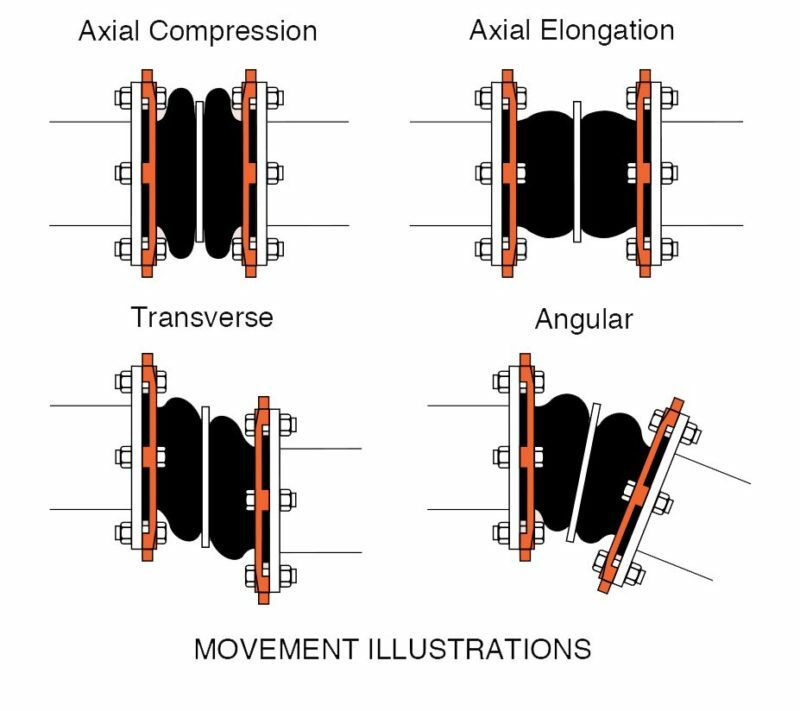 However, they can be compressed, extended, moved transversely or angularly in response to vibratory or thermal forces to a greater degree than most spool type expansion joints if anchors are introduced. When we started manufacturing spherical connectors, we believed, and later proved in various tests that for the first time we had a device that would effectively reduce fluid transmitted noise when spool type joints do not. The entire carcass of spherical, and particularly double sphere, designs breathes in response to the changing pressure caused by sound induced pressure pulsations. This serves to damp out this pressure wave in the fluid as the wave passes through the expansion joint. We have continually modified these designs to eliminate the need for control rods or control cables. Our very latest series (Safeflex) is extremely effective in doing so. Control rods are not needed at full pressure in all the sizes 11/2” through 14” both single and double sphere. Controls may also be omitted at most pressures through 24”. 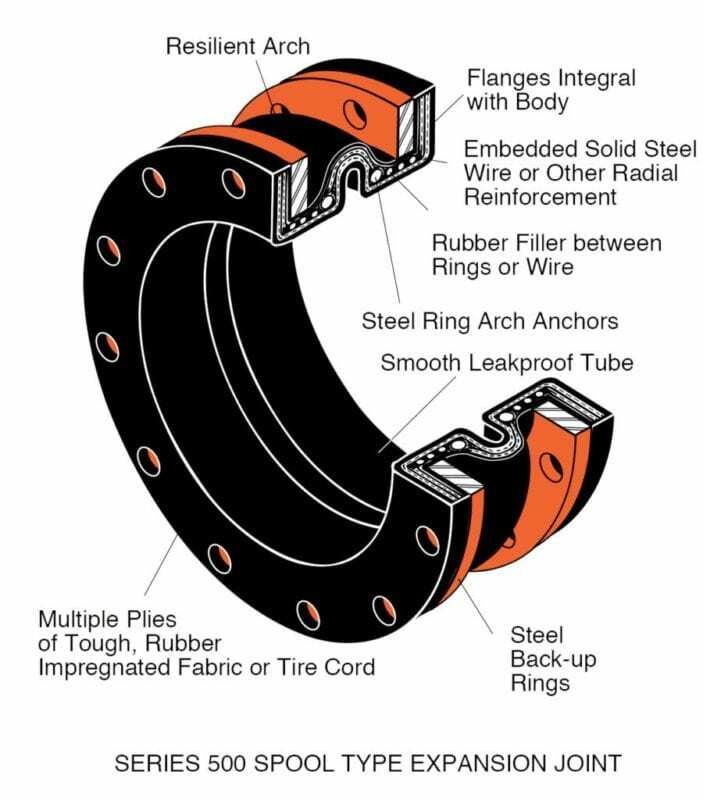 All spherical expansion joints are furnished with ductile or steel floating flanges that are independent of the body. The body is retained either by means of an embedded flexible cable bead held into a flange groove by a one piece flange or by split flanges that bear down on a rigid encased steel ring. It is actually the end of the connector that forms the seal and no gaskets are required. It is important, however, that the spherical joint mates with a solid surface and not a hollow flange such as those used in victaulic service. A simple spacer flange can solve this type of problem. Since the steel or ductile flanges are floating at each end, there is never a problem in installing these joints and lining up the holes and there is no possibility of torsional distortion during installation. Flanges are normally drilled to 150 or 300 Lb. ASA standards in the United States, but they are also available in DIN, JIN, PIN, Korean, British E or F as well as other world standards. Because our spherical connectors are used for noise and vibration, the most commonly specified device is the twin sphere. In our work we only use the single sphere where space rules out the double or where our client is working to lesser specifications by other firms. 3/4” through 2” sphericals are made with threaded ends. As a matter of historical record, we had produced spherical connectors in standard short radius elbows and in long radius elbow reducers. Although these devices were a technical success, there simply was not enough market demand. We continue to produce a wide range of concentric twin sphere, flanged spherical reducers. Please refer to our specific product bulletins for precise information about temperature, pressure and movement characteristics as well as the chemical resistance properties of the various elastomers.